Here is the Official Event Itinerary for more details and exact times. 9:00 am – 4:00 pm: Registration open on site for both downhill and super d.
9:00 am – 10:00 am: Registration open for super d.
11:00 am – 12:00 pm: Super D course closed for maintenance. 12:00 pm – 2:00 pm: Super D race. 2:00pm – 4:00 pm: Super d course re-opens for all others. 4:00 pm: Super d awards. 7:15am- 10:15: am: Open Practice on the downhill course. 9:00 am – 10:00 am: Amateur Registration will re-open for DH & Chainless DH. 10:30 am – 11:00 am: Pro seeding run. 11:00 am: Downhill start list to be posted. 11:00 am – 12 noon: Downhill course closed for maintenance. 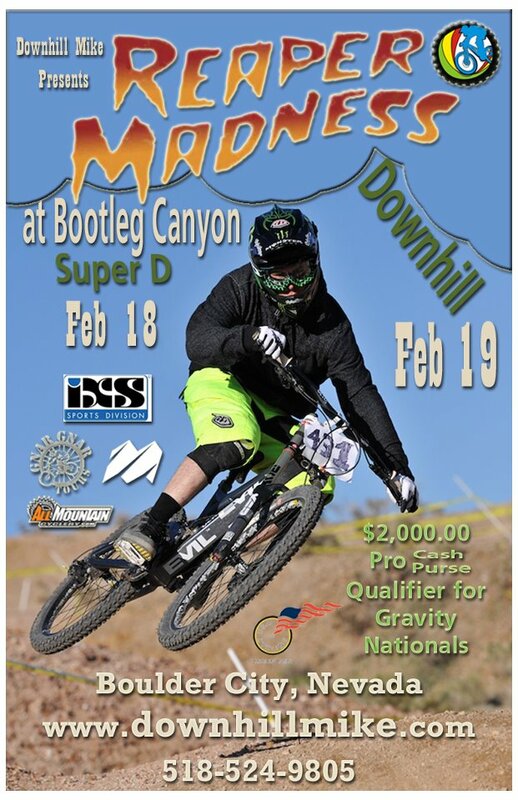 12:00 pm – 2:30 or 3:00 pm: Downhill race. 3:00 – 3:15 pm: Open Downhill (same course immediately after the main event). 3:15 pm – 4:00 pm: Open Chainless Downhill (same course immediately after the main event). Online registration ends this Sunday February 12 at midnight. On-site registration will be available (see itinerary) for an additional $10.00 per race.